Basically keep the same filename and placement, just in your new hud. You should also copy over the closecaption_english.txt file, but it's not necessary in this case since it doesn't actually get used. how would i fix this ? How would I go about making the background of the gamemode buttons transparent, similar to the main menu? 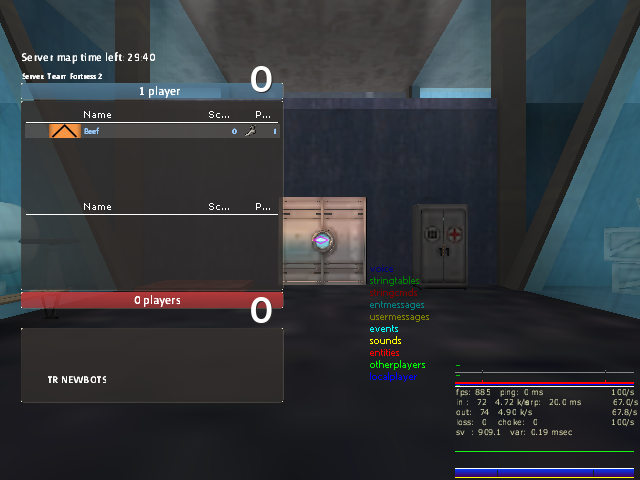 My hud scoreboard only has space for 5 people per team in 640X480 How do i extend the space for an extra player per team? how do you add a hud hitmarker? How do i add the page buttons in the bottom left hand side, as when im sorting out my bp, it is so annoying to not be able to just hover over a number in the bottom left and then instantly be on that page. chostarmanHow do i add the page buttons in the bottom left hand side, as when im sorting out my bp, it is so annoying to not be able to just hover over a number in the bottom left and then instantly be on that page. I would start by actually updating your resource/econ/backpackpanel.res from the default one and actually add in the page numbers, they allow for the hovering over the number while dragging an item to change to that page. The Hitmarker is a hud animation thing utilizing the DamagedPlayer event, making elements appear and/or change color. [quote=chostarman]How do i add the page buttons in the bottom left hand side, as when im sorting out my bp, it is so annoying to not be able to just hover over a number in the bottom left and then instantly be on that page. I would start by actually updating your [i]resource/econ/backpackpanel.res[/i] from the default one and actually add in the page numbers, they allow for the hovering over the number while dragging an item to change to that page. The Hitmarker is a hud animation thing utilizing the [i]DamagedPlayer[/i] event, making elements appear and/or change color. -Which values will move those indicators further away from my crosshair? -Which values make them skinnier? -Which values make them shorter? The more damage I take, does it make the indicators both wider and longer? How do I get combat text to show as part of the HUD? Not floating above the people I'm shooting, but above the ammo or something. ScrambledHow do I get combat text to show as part of the HUD? "fgcolor"	"0 255 255 255"
throw that in the huddamageaccount.res file in resource/ui and it should work, granted you give it a font. [quote=Scrambled]How do I get combat text to show as part of the HUD? Not as far as I'm aware. Taking damage from multiple sources will create more indicators though. Try setting the scores > nemesis_width column width to 0 and hope it doesn't auto resize. Try setting the [i]scores > nemesis_width[/i] column width to 0 and hope it doesn't auto resize. hi all, just a quick question. in the inventory, i have got numbers in the bottom left-ish part of my screen (the pages in the inventory), but how do i add an 'a' and 'd' thing so i can easily change page? chostarmanhi all, just a quick question. in the inventory, i have got numbers in the bottom left-ish part of my screen (the pages in the inventory), but how do i add an 'a' and 'd' thing so i can easily change page? You can make some hidden offscreen buttons to do the same functionality. Or you can change the labeltext of the existing buttons to be &a and &d instead. imo a lot of questions you ask can simply be answered by looking at the files of other huds and trying to figure out how they solved the thing you're trying to achieve. You can make some [url=https://github.com/Wiethoofd/WietHUD/blob/master/alternatives/backpack_buttons.res#L43-L58]hidden offscreen buttons[/url] to do the same functionality. Or you can change the labeltext of the existing buttons to be [i]&a[/i] and [i]&d[/i] instead. After testing and messing around with the pos values to get it centered, the seeker correctly puts itself above the entire crosshair, which is what I wanted to do. Still, I did'nt managed to change the color of it when it blinks and I have no Idea of to use the Alfa and FgColor lines to control that. Also tell me if something is unclear about my post or if you need extra screenshots! After testing and messing around with the pos values to get it centered, the seeker correctly puts itself above the entire crosshair, which is what I wanted to do. Still, I did'nt managed to change the color of it when it blinks and I have no Idea of to use the [b]Alfa [/b]and [b]FgColor[/b] lines to control that. HudMatchStatus.res controls the player panels and background behind it. [i]HudMatchStatus.res[/i] controls the player panels and background behind it. 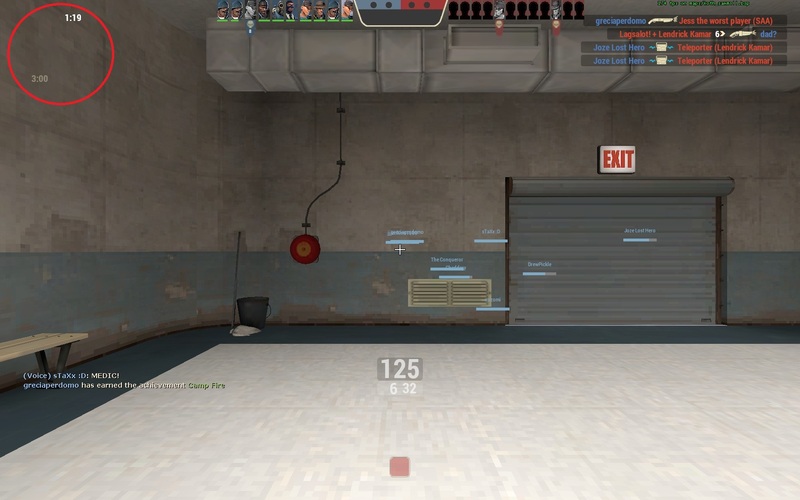 if im using a custom crosshair, how do i get it for specific slots/classes only. class.cfg? Di4if im using a custom crosshair, how do i get it for specific slots/classes only. class.cfg? I think its not possible but you can set a bind to toggle between minmode and normal hud, and then set the crosshair to [code]"visible" "1"
I'd like to have the dropdown menu draw horizontally instead of vertically, how would I go about changing the animation? I'd like to have the [url=http://i.imgur.com/n3TI0mY.png]dropdown menu[/url] draw horizontally instead of vertically, how would I go about changing the animation? @Silvvy: MMenu_PlayList_Expand and MMenu_PlayList_Collapse(_Immediate) are the animation events you're looking for. @Silvvy: [i]MMenu_PlayList_Expand[/i] and [i]MMenu_PlayList_Collapse(_Immediate)[/i] are the animation events you're looking for.